The thalamus forms the largest part of the diencephalon. 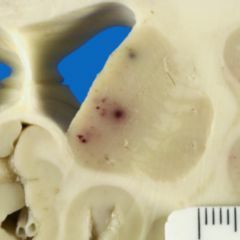 It consists of numerous nuclei (aggregates of neurons) that have especially strong connections to all of the cerebral cortex. All ascending tracts – except for the olfactory pathway – on their way to the cerebral cortex have to be relayed in the thalamus. 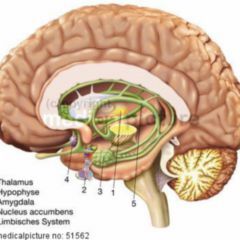 Because all sensory/sensitive stimuli only become accessible to consciousness after passing through the thalamus it is also called the "gateway to consciousness". The thalamus consists of two halves that are each about the size of a pigeon's egg. They medially border on the third ventricle and laterally border on the internal capsule. Left and right thalamus are usually connected via the interthalamic adhesion. Specific thalamic nuclei have afferent and efferent connections to certain regions of the cerebral cortex. They receive sensory impulses from peripheral nerves via the spinal cord which they relay to the cerebral cortex. Nonspecific thalamic nuclei have no or only very weak direct connection to the cerebral cortex. They receive input from the reticular formation, the cerebellum and the basal ganglia and have efferent connections to the basal ganglia and the specific thalamic nuclei.